Downsizing is a film that has no purpose, no reason to exist, and which lurches from one idea to another in the hopes that it lands on a story. It follows one idea, only to drop it, introduce another, then forget that idea for another one, going all over the place but nowhere in particular. A new method has been discovered that will shrink people to about five inches. Ostensibly useful to save the environment from over-consumption and climate change, it is found that those who do shrink, or 'downsize', can actually have more money because in the miniature world, it somehow expands. Paul Safranek (Matt Damon), who is struggling financially after caring for his ill mother and paying his student loans, is fascinated by this idea. His wife, Audrey (Kristen Wiig) is not so eager but thinks it is something to look at. After talking to a classmate at a reunion who himself was downsized, Paul and Audrey go to see a miniature community called Leisureland. I think here I'd like to say that 'Leisureland' sounds like a retirement home, but there it is. Leisureland is a bit like Disney World with their own buses and aggressive selling points. Here, their small amount, plus generous deductions can assure all Leisureland residents a life of ease, where all their worries are done. Paul and Audrey decide to join. For this procedure, you must be completely shaved and have your teeth removed, and while Paul goes through with it, unbeknownst to him Audrey pulls out at the last minute, calling him from her still regular-size world and begging his forgiveness. That happy world Paul thought he was going to live in, full of creature comforts and no financial worries, is now all gone. His depression deepens after his divorce from Audrey and his relegation to a small apartment (no pun intended). He starts dating, but the single mom he finds himself with does not want to further the relationship, angering him. Paul decides to take up the invitation of his upstairs neighbor, the loutish Euro-trash Dusan (Christoph Waltz). A slight touch of Dusan's decadent lifestyle leaves an impression on our now-Land's End customer service telephone rep, as does Dusan's cleaning lady. It's none other than Ngoc Lan Tran (Hong Chau), a Vietnamese activist who was downsized against her will, having been involved in smuggling humans through TV boxes. Ngoc is also without one leg, and Paul is shocked that our heavily-accented stereotype is living outside Leisureland's lush area in what is essentially the ghetto. As with all good ghettos, it is filled with nothing but Asians and Mexicans, and is behind a wall (though the Leisureland Rapid Transit does take people there). Here, Paul is now going to be the white savior all these poor people need, but there's no time for that. Dusan and his friend Konrad (Udo Kier) are having a meeting with Dr. Jorgen Asbjornsen (Rolf Lassgard), the man who created the downsizing technology up in Norway. One thinks this is a way to get our white savior to not be degraded to dumb cleaning crew (something apparently only accented Vietnamese and Mexicans can or should do). However, as Ngoc has gained a level of fame, she manages to push her way to the meeting. Dr. Asbjornsen tells them the world is coming to an end, even for little people. Something about the gas that has been released with the melting ice caps. He will take all those from his original community to an underground lair where they will sit out the apocalypse while everyone else dies. Ngoc, Dusan and Konrad won't go, but Paul pushes that he and Ngoc, with whom he has become romantically involved, go down to become future Morlocks. At the last minute, our white savior decides he cannot do it (probably more due to the eleven-hour march than any real sense of obligation, and goes back up, where he will help all those poor Mexicans and Vietnamese who cannot help themselves without his aid. Seriously, does Matt Damon really have this oddball complex of playing white saviors? He's done so in The Great Wall, and his penchant for 'Damonsplaining' all manner of things constantly show that for all his certainty in his intellectual prowess, he's pretty much an idiot. All that perhaps could be overlooked, but not the fact that Downsizing came from the mind of Alexander Payne, the man behind such excellent films as Sideways and Nebraska (I wasn't big on The Descendants). Payne, cowriting with his Sideways partner Jim Taylor, wrote a film which is shockingly scattershot, flying off in endless directions and worse, trying to employ various messages that never do anything for the film. Is Downsizing an environmental film? A spoof of consumerism? A tale about these hard financial times? A pro-immigration platform? A vehicle about how awful racial stereotypes can be fine so long as good liberals employ them? Why not all of them? At least, judging from Downsizing, that was Payne and Taylor's mission, but I would advise Payne that he is not suited to make pointedly sociopolitical films. I don't remember much virtue-signaling with Sideways or Nebraska, so why he opted to try his hand at so many messages with Downsizing is a bit of a puzzle. It's as if Payne simply could not settle on one story, or worse, saw that his first story ran out of steam early on and he kept adding more plots to pad the thing, with it going all over the place and not settling into things. Many things, such as how this ghetto managed to find itself outside the walls of Leisureland came to be, are both not asked and not answered. Paul's very wealthy friend (Jason Sudekis) disappears from the film, that part essentially taken over by Waltz. The plotline about his dating life, with a person we were barely introduced, disappears too, and we get Ngoc introduced as our 'love interest'. I'm at a loss to explain or understand how and why Paul became enamored of a pushy, one-legged, heavily-accented Vietnamese. There was some talk of a Best Supporting Actress nomination for Chou, and having seen Downsizing, I think the people making this suggestion were either drunk or paid off. Ngoc is a caricature of the 'illegal immigrant', and worse, has one of the most galling stereotypical accents in films today. Mickey Rooney in Breakfast at Tiffany's sounded better. It is simply astonishing and shocking that the pidgin Chou had to speak in could have come with the help and support of Payne or Damon, who I figure would have been appalled if someone else had forced this stereotype on the public. Many things are mentioned then forgotten in Downsizing, but one that I picked up on was on how, pre-shrinking, Ngoc was presented as strong and vocal, but post-shrinking, she was helpless. One would have thought all the wealthy liberal elites in Leisureland would have welcomed this dissident into their world, feted and celebrated this advocate for the dispossessed. Apparently though, they could not be bothered with the likes of her, so maybe Downsizing is among other things, a spoof of liberal do-goodism in the same vein as a Get Out. I thought her performance embarrassing, as well as that of Damon and Waltz, both who could do better. Downsizing is the third flop for Damon (The Great Wall and Suburbicon being the others), and this one was probably worse in that it was pulled from theaters less than a month from its hoped-for Oscar chances. 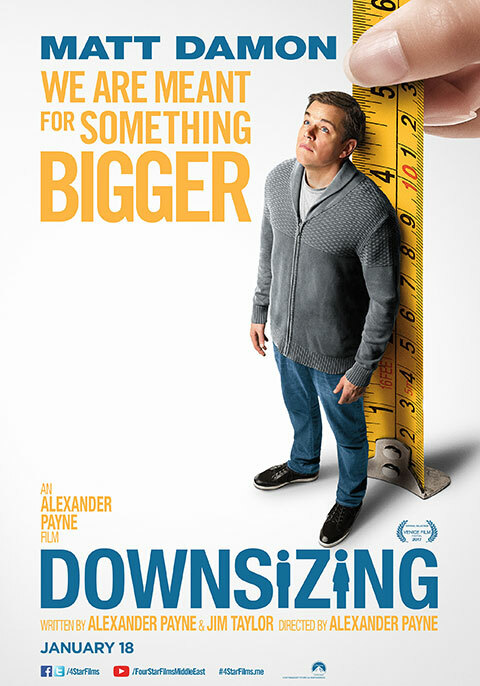 Downsizing is just a bad movie: neither clever or insightful, with no purpose or goal or direction as to what it wants to be. This film has major shrinkage problems. Wow, they actually had Oscar hopes for this movie? That's sad. From the trailer the best case scenario for its quality would have been like We Bought a Zoo, I'd have said. I completely forgot that it even existed, but I really enjoyed your review! Part of me would have liked Chou to have been nominated, if only so that the Oscar telecast viewers who hadn't seen 'Downsizing' could see how a virtual stereotype was held up as a potential Oscar winner. Would have loved to have seen Twitter reaction to a clip of Chou and her 'accent'.